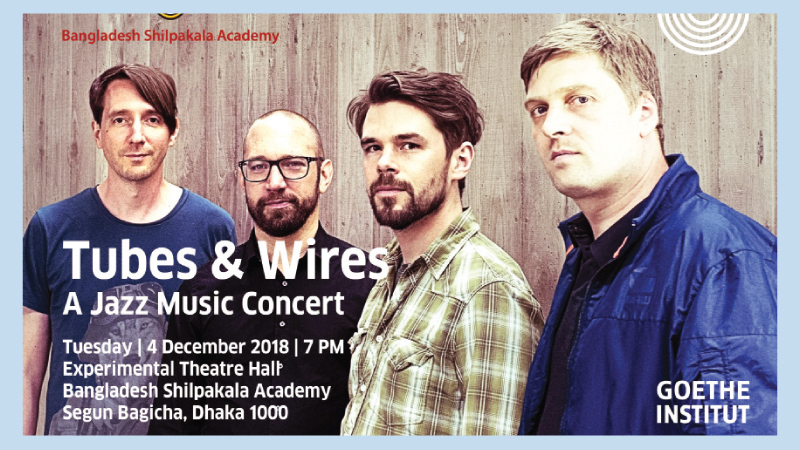 Goethe-Institut Bangladesh, in cooperation with Bangladesh Shilpakala Academy (BSA), is organising a Jazz music concert by German band Tubes & Wires tomorrow evening at the Experimental Theatre Hall of Bangladesh Shilpakala Academy in the capital, reports the Independent. Niels Klein’s quartet Tubes & Wires is not your everyday line-up. With Lars Duppler on e-piano and synthesizers, Hanno Busch on guitar and bass. Ralf Gessler on drums, and the bandleader on various clarinets, Klein presents forceful rock music that is played with the attitude of Jazz musicians when it comes to instrumental technique. Saxophonist, clarinettist and composer Klein named his band and new CD somewhat jokingly Tubes & Wires. ‘Tubes’ stands for the various clarinets that Klein plays and ‘Wires’ represents the many electronic, analogue and digital devices that connect with cables and drive his ‘effect clarinets’.